Having paper wasps buzz around your home can be more than just an annoyance. You have to worry about your family and visitors being stung. If you are dealing with this, then you need Bug-Man Pest Control to handle your paper wasp extermination. There are 22 different species of paper wasps in North America, alone. These insects can range from ¼ to ½ in. length. Usually they are black with various yellow, orange, or greenish markings, depending on the species. One of the biggest issues with these insects is that they build their nests above your head. Usually, that means they will attach somewhere to your porch or eaves of the home. When they are flying above your home, they will often attack if they feel threatened . 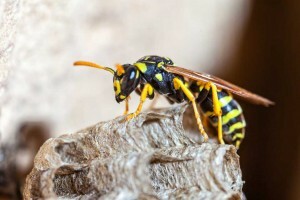 If you have these insects nesting in your home, then you need paper wasp removal. What is Paper Wasp Extermination? Since these bugs build nests on your home or nearby, the entire nest will need to be removed. Once the paper wasps are sprayed with pesticides, the nest will be taken down. If you have this problem, it is best to not handle it on your own. Since there are so many different species, you might be allergic to this one and not know it. Take note that during the day is the worse time to bother a nest. They are more active when it is light outside. If you have this problem then you need paper wasp extermination by a pest control company. Who is a Jacksonville Paper Wasp Exterminator? It is best to hire Bug-Man Pest Control to handle your paper wasp removal, the professionals that are able to safely remove the insects without anyone getting stung. We use pesticides that can freeze wasps in their place. With our service, you will no longer need to deal with these insects. We are a Family Owned and Scientifically Operated business. It is our mission to build a long term relationship with our customers. If you have need of a paper wasp extermination, please contact us today and schedule your appointment so that we can get right over there and not only eliminate the wasps around your property, but remove the ugly paper nests as well.